Happy Summer! 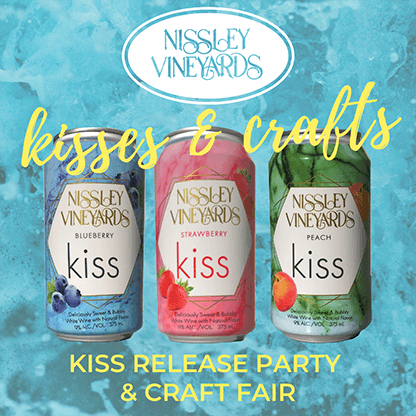 Nissley Vineyards finished up the spring season with “A Taste of Spring,” wine tasting and social event Saturday evening, June 10th. The event was hosted by Jen Wampler, the winemaker & Melody Nissley. John and Jonas Nissley helped too. To begin the event, Melody and Jen gave the group a personalized tour of Nissley Vineyards. Everyone enjoyed hearing about the Nissley’s family history, and how it became the well-established and successful winery it is today. Our story began 40 years ago! 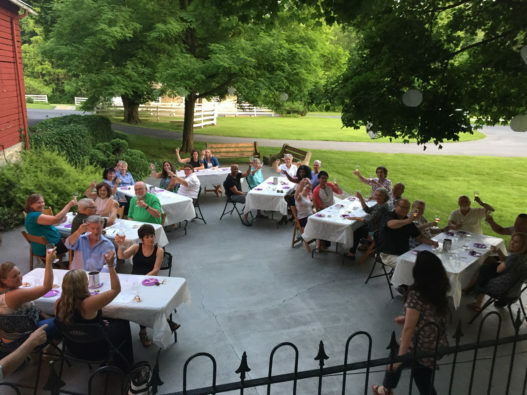 Thirty enthusiastic attendees came out on a warm spring evening to taste our spring wine releases and gold medal winners. Jen selected six wines and thoughtfully paired each wine with a specific cheese and then a carefully selected chocolate from Miesse Candies in Lancaster. The group raved endlessly about the Vignoles (international gold medal winner) paired with white chocolate covered orange peel, and Havarti cheese. They noted that the orange brought out the tropical notes of the wine and they felt this was a perfect spring delight. We agreed! Many were pleasantly surprised with the pairing of our dry, red Chambourcin, paired with Dark Chocolate Ghost Pepper, and Mozzarella cheese as well as Pepper Jack. The Ghost Pepper sounds a little frightening, however, the hint of spicy pepper brought out the oak in the wine and did not linger too long on the palette. The selection most enjoyed was, without a doubt, the Black Raspberry paired with cheesecake. Even the dry wine drinkers were over the moon with this decadent dessert. 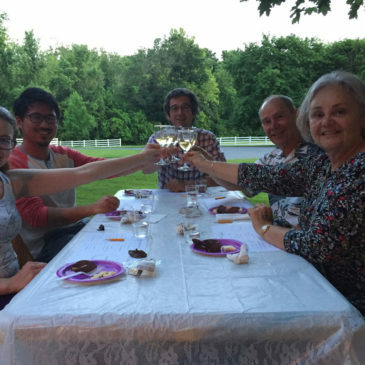 Everyone had an enjoyable spring evening under the stars, and left feeling quite contented with their souvenir logo glass that had a surprise sample of our newly released Whisper White, which is a white wine blend with pear wine. The gang is looking forward to coming back for the “Music in the Vineyards” summer concerts. We were asked if we would do “A Taste of Autumn,” pairing event, so, stay tuned!